One man's steps to a greener lifestyle. Over the last few months I’ve gradually been adding to the capability of my HEMS which determines when is the cheapest time at which to buy electricity for different purposes. After initially controlling my car charging only, I’ve now added both immersion heater control and battery storage control. To the left and centre the picture shows the plan of the HEMS for two twelve hour blocks of time from when the cost data was last updated by my supplier. To the right is the real time display of my home. It’s a dull day so only 258 Watts is coming from the solar panels (maximum of 4,000 Watts), and so the HEMS has been buying energy from the grid to charge the battery when the price is low. 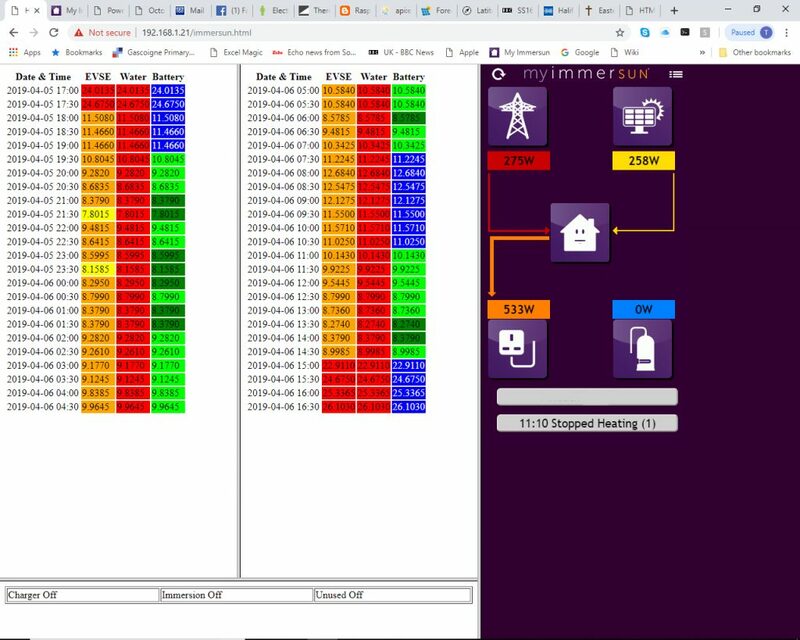 For each of the panels to left and centre, the electricity price is displayed for each half hour, with the colour-coded decision of the HEMS for what to do. red – the energy price is above a configurable upper cost threshold, so the car will never charge. green (not shown) – the energy price is below a configurable lower cost threshold, so the car will always charge. yellow – these are the cheapest half-hours. The HEMS will enable charging for the required number of half hours to deliver a configurable number of total hours with a user-defined time window (typically overnight for the car). Overnight was configured for only 1 hour, although 5 would be more typical for a full charge. orange – these half hours are more expensive. The HEMS will not enable charging in these hours unless the configuration is changed for more hours. Water heating follows the same control strategy, but is configured to only heat water during plunge pricing events when the electricity price falls below the gas price. Upper cost threshold – never charge when price above this threshold. Lower cost threshold – always charge when price below this threshold. Start of time window – arrival time for charging. End of time window – departure time for charging. 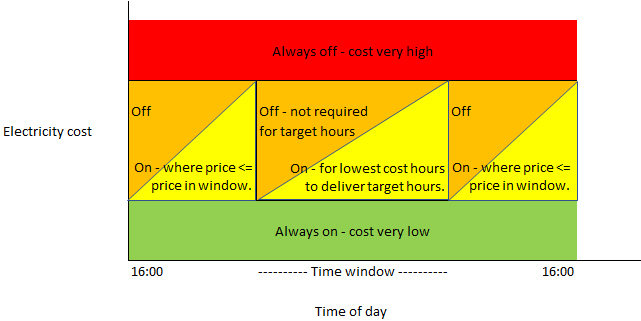 Target hours – number of hours of charging/heating required within time window. blue – normal – the battery automatically either chargers or discharges either to absorb any surplus solar electricity or displace bought electricity when demand exceeds solar availability. Here used when the electricity price is highest. light green – charge only – will charge proportionately to any solar excess as above, but will not discharge. Here used for mid-range electricity costs. dark green – force charge – charge at maximum power drawing power from the grid as necessary. Here used for lowest electricity prices. This entry was posted in Smart meter and tariffs on 06/04/2019 by Greening Me.